It's shopping day!!! Aren't you so excited about this My Creative Time release? I'm so happy that it is summer and I have lots of time to keep playing with it! There is so much to do with these sets! You should have arrived here from Emma's blog. If you just happened upon here, head back to see the full release! I used the Happy Thoughts stamp and die set for today's 3 1/2" x 5" card. It was very easy to make. I took a 3 1/4" x 5" piece of white cardstock and adhered a pattnered piece of paper to it that was cut at a diagonal. Then I lay the "thanks" die from this set on the diagonal and secured it to the cardstock with a bit of washi tape before running it through my Vagabond. I adhered the resulting piece of cardstock with the "thanks" missing to my card base, die cut "thanks" again out of blue cardstock, and adhered it into the opening left behind from my first cut. I then stamped "many" and the cute little hearts using stamps that come with this set. The heart dies also coordinate with the MCT Stitched Heart Layering Dies, so I know I will be using them with those a lot as well. Below is a look at the entire set. It's a fantastic one for making quick and easy cards! 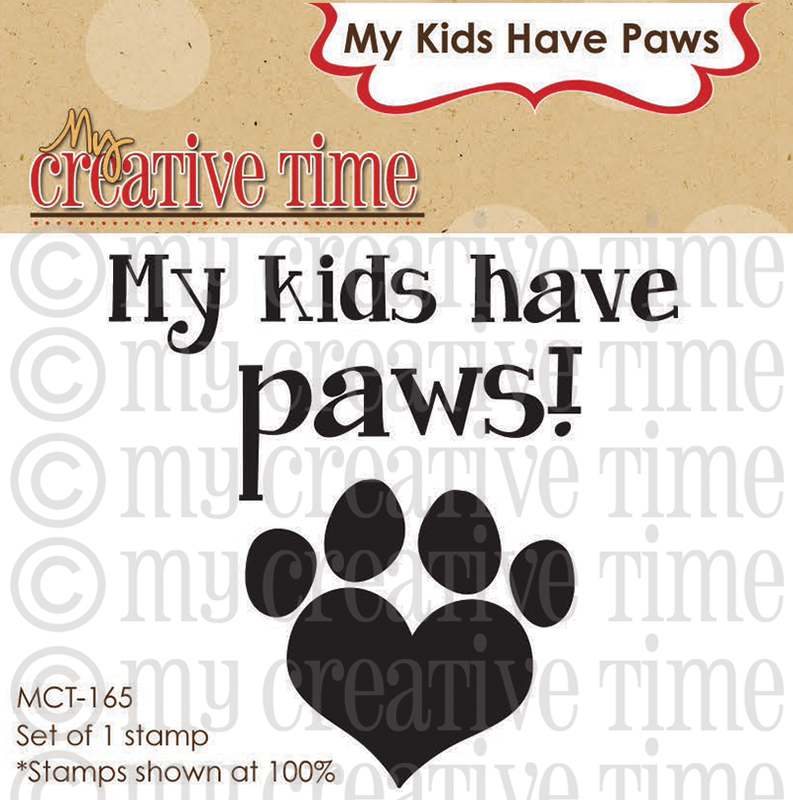 Since the last release was such a success, Emma wanted to show her appreciation by giving away this FUN new "My Kids Have Paws" stamp to the FIRST 150 shoppers! YEP, you heard that right, this stamp will go to the FIRST 150 shoppers for FREE! You do NOT have to add it in your cart; Emma and her shipping crew will automatically include it in your package, but ONLY to the first 150 shoppers! IF you happen to come through AFTER the 150th shopper, no worries because this will be available for sale! Emma knows there will be questions on whether YOU made the first 150. After the first 150 shoppers come through, then you will see this set available for purchase along with the new release items! Also, DON'T FORGET our sale that is starting RIGHT NOW! Use the code JUNE2014 to receive 20% off your entire purchase! Sale ends on July 4th @ midnight, PST. Your next stop is the super talented Nikki! Your card is FABULOUS Miss Katie!!! Nice idea to cut bottom part of word thanks and then fitting it in to the patterned paper. We forget these little things until reminded. Love it!! That is my favorite set! What a darling card! Fun release! Super cute Katie! So clean and simple! Beautiful card and great explanation on how to do it. Your inlay cards are so pretty! Wonderful job! Cute card! 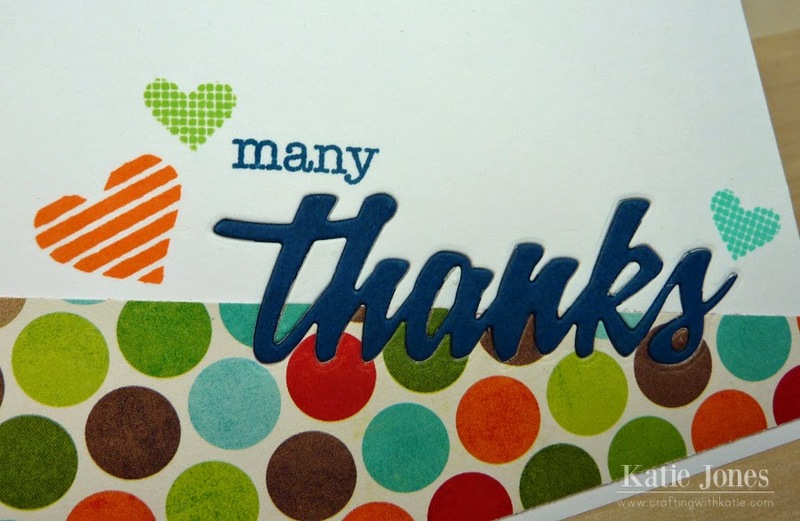 Love the way you used the Thanks die:) Thanks for sharing. Love this diagonal design, Katie. Such a creative idea. It looks really fabulous. What a great card... looks very elegant! Katie, this is festive and colorful. Love it. So pretty and full of color. great idea to have the two backgrounds cut on a diagonal. Makes for an interesting page. Oh Katie I LOVE your card. What a great design. Thanks so much for sharing this beauty. Beautiful card Katie. Love the colors! Love your card. I'm so into the die inlay! Love your card. The inlaid die cutting is perfect. Totally fabulous and fun!! Great release! this card is so cute!! I love how you did the die! thanks for sharing! The stamp are awesome and love the versatility. Katie what a cute and simple card! Love it!! Seems so easy to put together a quick card with Emma's dies. Yours is great. TFS. Fantastic card! Love the dotted paper and colors! I love how you inlaid the Thanks! Wonderful! Cool card Katie. I ordered this set. It looks like I will use it a lot for quick cards. Everything is so darn cute! I especially love the Bee Happy stamp set and the Bee Hive die!! I cant wait for them to arrive! This was an awesome release. Fabulous showcase of the new release! Katie ~ OMG I LOVE this card! I LOVE how you inlaid the word die and the design of this card! EEK!! I have to try this soon! Then the colors of the papers ~ seriously AMAZING job as always! Totally lifting this idea!!! This is so pretty!! I love how you did the die for the inlay!! Hugs! LOVE your card! All the colors work perfectly together. TFS! What a beautiful card Katie!!! LOVE the color combo and how you did the "thanks"
You have WOWed me all week!!! :) so many wonderful creations! And I love how you embed the die cuts! Thank you so much for sharing your time & talent with us!!!! what a great card, very very fun! !